In 2017 AngryWorkers organised a series of events about what’s going on politically in the USA. We spoke to comrades involved in grassroots activities to try and get a sense of what’s happening on the ground. What’s actually going on behind a lot of the headlines and rhetorical bluster that is often generated by the Left and the press more largely? But we also wanted to visit America and so when the chance arose to go to the labornotes conference in Chicago we decided to combine this with a little tour to meet various people and get a sense of the atmosphere post-Trump. This is a short report of our scattered impressions of this 3-week trip in April 2018. Firstly, the labornotes conference itself. It was huge! Around 3000 people were said to have attended the event, which brings together rank-and-file unionists and labor activists, over the 3 days, with 200 parallel workshops running. It was the largest one ever, which itself is an indicator of the shift in people’s activities and engagement. This can probably be accounted for by the post-Trump effect that has created a sense of urgency to act, as well as concrete changes to labor laws (e.g. the Janus ruling that effectively bars unions from collecting fees from non-union members), as well as broader developments that has seen pay plummet, services further eroded and more direct action being taken on the streets with movements such as Black Lives Matter, Fight for $15 and the Women’s March, as well as massive, well-coordinated and successful strikes such as West Virginia teachers’ and Verizon. We were also invited to speak at the Railroad workers’ convention that happens at the same time as the labornotes conference. We shared beers and peanuts with some great folks, an impressive network of militant rank-and-filers who can provide strategic knowledge in mapping a wider logistics structure in the US. In the only way that Americans can be, the mood and speeches were definitely of a ‘can-do’ variety. As an outsider, I was struck by how articulate everyone’s impromptu speeches and contributions were. The majority of the workshops were focused on the USA but Angryworkers were on a panel with comrades from Poland who organise at Amazon through their grassroots union, Workers’ Initiative, and SI Cobas who organise warehouse workers in Italy. Around 100 people turned up to hear about our respective experiences and approaches to organisation. It became clear over the trip that people had a particular thirst for getting involved in organising at Amazon. We were really surprised at how few groups had attempted to infiltrate this behemoth of an organisation, especially considering the amount of academic literature that has been produced about the importance of Amazon as a sign of changing labor relationships and systems of production. We met a few people along the way who were about to embark on a ‘salting’ expedition into the Amazon warehouses and they could also link up with each other at the conference. We look forward to hearing about their first-hand experiences. However, there is an important story behind the film, which deserves to be told. This IWW comrade said that the Walmart strike was actually a strategic and pre-planned salting effort, which the film does not go into. There is nothing wrong with this per se, but if we only see the strike as developing as a more-or-less spontaneous workers’ self-organisation, we are not being honest about what was possible in that situation and the driving forces that affected the way in which the struggle was conducted and how it ended up. Our IWW comrade told us that he was part of a second batch of salters who had gone to work at the Walmart warehouse with an express desire to organise workers there. In a stupendously large warehouse of 2500-3000 workers in the middle of a logistics hub in the middle of nowhere, the eventual ‘strikes’ engaged around 25 workers, out of which 4-5 were salts, who in turn, were all temp workers. In the first wave if struggles, some workers were fired, including the amazing Ulyonda Dickerson in the film. She went on to become a union organiser, although our comrade was unsure of her activities and whereabouts now. These fired workers were eventually compensated £6000 for illegal firing for striking against unfair labor practices. They were not re-hired as the temp agency contract, predictably, was terminated by Walmart. The amazing thing about the Walmart strike was that the organisers (one of which was Fight For Change) managed to get 600 supporters at the warehouse gates. As I said, this logistics hub is on the outskirts of Chicago, in a place called Joliet. None of the comrades we stayed with in Chicago for the conference had even been there. It was around a 45 minute drive from the city. We went there on a warehouse-spotting expedition to get a sense of the scale of the place. Going there made it all the more impressive that such a struggle had taken place there that shut the warehouse down, ordinarily out of the eye and ear-shot of most of the city’s activists. The film gives the impression that it was this group of workers and supporters who managed to temporarily close down the Walmart warehouse, but our IWW comrade told us that the road was actually closed down by the riot police because news of an impending strike had gotten out. This is not to downplay the actions of the workers, organisers and supporters, only that there is no reason, amongst ourselves at least, to know really what happened and to build on our existing strengths and weaknesses. In the aftermath, the 2 organisations working behind the scenes split because of internal disputes and nothing was left organisationally inside the warehouse when the funding was pulled. Health and safety conditions did apparently improve though. Our IWW comrade was later hired as a salt by the SEIU for their McDonalds Fight for $15 campaign. His employment as a salt only lasted 1 month as the unions decided to withdraw all their salts, although it was unclear to me why this was. It was already quite a way into the nationwide campaign anyway. Within that month, our comrade successfully got 5 or 6 workers to go on strike for a day. When the union stopped paying him, he decided to continue solely on the McDonalds wage which ended up making him homeless. On his own this time, without the union behind him, he took out the workers on strike twice more. No gains were made, apart from the fact that workers did not lose their jobs as a result and were let back into work the next day. In itself, that is something. The SEIU ended up withdrawing a lot of the campaign money because their approach was not working. Maybe this was because they were putting more resources into a public facing campaign rather than investing longer-term in salts and workers’ organising on the shopfloor level? There seems to be more of a salting tradition in the States, and it is not looked at with the same disdain as in the UK. It would be great if we had more insight into this process, whether this is through the big unions or not. This approach by the big unions is apparently a copycat strategy from smaller unions e.g. the Starbucks campaign, which had quite a bit of success. We saw Unite in the UK adopting this strategy a couple of years ago with the Unite Hotel workers branch. There are obviously benefits to having an insider perspective, even if only for a shorter period of time, but in terms of building a longer lasting capacity, what would be required? We hope our IWW comrade finds time to put all of his experiences to paper, even from his individual point of view. From Chicago, we travelled to Detroit. There was no way we could avoid being ‘poverty tourists’ – we were there for only a short period, we obviously wanted to see the city (the only way being by car), so we ended up being driven around street after street of boarded up housing. It is how you would imagine, only it is disconcerting how easily one becomes used to such a landscape. It was also interesting that many of the boarded up houses are not just shacks, but include houses that would be mansions by UK standards. House prices are rising and the centre of Detroit has been totally regenerated (complete with totally useless cable train that goes round and round in circles) but the city still seems a very long way off recovery. The decimation was shocking, even if you are somehow prepared for it. This wasteland also gives opportunities for people to live together in bigger groups, to take over and buy massive empty houses that they can slowly do up and live in affordably. This is what our hosts had done – they had bought their now beautiful mansion for $20,000 and 10 years later it was now worth $80,000. They had chickens in the garden and space for at least 10 people. But building the IWW in a city where so many people are unemployed is undoubtedly problematic. Our great hosts drove us around the Ford Rouge plant, we visited the IWW archives, we looked at all the old copies of the former student newspaper taken over by the League of Revolutionary Black workers, we saw the Rivera mural and sampled some excellent Mexican food. Safety is a big issue though; we could not walk around much – when we wanted to walk the 10 minutes back to the house from a bar, a discussion had to be had about whether it was safe. From there we got the overnight Greyhound bus to New York. These buses were actually worse than the megabus. We met various comrades, many of which had joined the DSA. The Democratic Socialists of America had a massive upswing in membership after Trump was elected. It attracted a lot of new people into the scene and consequently, a lot of politicos who had been around the block a few times also joined as it was a fresh and ripe recruiting ground! There seems to be little in the way of centralist approaches – people attend meetings with their own interests and can link up with others who are interested in similar issues. We met a guy in DSA who was about to start working at Amazon with an eye to organise, although it was not a ‘DSA thing’, rather there were people who were interested in Amazon who had formed a small group within DSA. It seems to function more like a network and in New York alone has 3000 members. It would seem sectarian in this context perhaps to snub it if you were on the libertarian and communist left. We took short trips to Providence and Hartford to meet IWW comrades there. An Amazon fulfillment centre had opened on the outskirts of Hartford in 2015 in the town of Windsor, and there’s also a sorting facility about 30 miles south, in the town of Wallingford. There’s also another warehouse breaking ground soon in North Haven, which is the next town south of Wallingford. Hartford is a place where there’s both a low amount of worker organising happening currently, and a heavy concentration of Amazon workers living in the city limits. Providence was smaller but a group of dedicated comrades were gathering a lot of experiences and knowledge about their local area and concentrations of mainly service workers. We look forward to reading some reports from them in the near future. Thanks to everyone who hosted us, came to our presentations and discussion events, who drove us around, told us about what they’re doing and offered us hospitality and comradeship. Feel free to come to our neck of the woods in west London for a warehouse tour and some ale or tea if you’re ever in the UK! Fresh from the wildcat victories of teachers, the slogan of the conference was, “There is no such thing as an illegal strike, only an unsuccessful one!” And the keynote speech from one of the main organisers in West Virginia was, for me, the highlight of the conference. The amazing thing about the Walmart strike was that the organisers (one of which was Fight For Change) managed to get 600 supporters at the warehouse gates. As I said, this logistics hub is on the outskirts of Chicago, in a place called Joliet. None of the comrades we stayed with in Chicago for the conference had even been there. While technically and officially, Joliet is considered a part of the Chicago metro area, it is not a suburb, but instead a separate city of 150,000. A former industrial city with a strong union tradition, it would not be surprising to be able to turn out support for a high profile organizing campaign. It's not shocking that the people you stayed with had never been there. Many Chicago natives are very insular, with a life that exists within a 5-10 mile radius of their neighborhood. Meanwhile, many transplants to the city from outside the region, particularly those who would be involved on the left or in labor, are most likely going to stick around the various gentrifying neighborhoods of Chicago and have little reason to explore the broader Chicagoland area. I never really thought about this much, but you're likely correct. I don't know the history, but the contemporary IWW is far from the only union to do this. Many AFL-CIO unions have formal salt programs that have been around for a while now. I associate salting with the so-called 'Organizing Model' that developed in US unionism in the 1980s but I'm sure it predates that. Another thing...it's somewhat surprising to see Labor Notes talked about positively, even somewhat less critically than I would expect for a blog on this site. While the anarchist/IWW circles I moved in often had some varying participation in the conferences, the limitation of the background, demographics and purpose of the conference/publication was acknowledged. I always saw Labor Notes as primarily a networking effort for 'bore from within' socialists and lower to mid-level AFL-CIO officials. So while the 'Organizing Model' is put forward as way to revitalize the labor movement, there has been just as much focus on running slates to elect a more 'democratic' or 'progressive' labor leadership. That's not to say it isn't worth attending. You can get first or second hand accounts of campaigns that there isn't a lot of information about. You can also learn a lot about a certain layer of the labor movement. It's also surprising to see that AWW was allowed to speak at the conference because, as I understand it, they are a non-union political organization that attempt workplace organizing as outsiders. Labor Notes has traditionally banned such groups from even tabling. What do you mean by "as outsiders" here? I thought their approach was very much "insidery", but that could be a difference in terminology. I thought they were an outside organizing effort? As in, they don't work at the places they are attempting to organize at/with. Am I wrong? AWW is an umbrella for a paper, workplace groups, and a solidarity network. afaik it's a mixture - they've taken jobs at factories, but they also do a solidarity network drop-in thing, and some factory gates stuff at places where there's no contact inside. It's probably more accurate to call it an "exurb," because the Schneider Logistics' distribution center complex is actually in Elwood. It's at the southern reach of the massive logistics hub, squeezed between the now-defunct Joliet Arsenal, the BNSF Chicago Logistics Park, and is spreading to pave over farm land due south of Elwood into Jackson and Manhattan Township, which is still rural and heavily agricultural. Local residents are protesting against Northpoint Development’s Compass Business Park Proposal, which plans to acquire 2,000 acres of farmland to build intermodal warehouse facilities to allow the whole complex to continue to sprawl south. Not true. If you go to the literature area of the conference you’ll see some diverse groups, including the IWW. It does have its orthodoxy, but a slow generational shift is making it a little more open and a little less sectarian. Ah. I've always been confused as to what exactly AWW was. I don't think it's an exurb either. Very few people commute between the two cities. Joliet is more of an independent city within the massive Chicagoland area. I think 'what it is' is more contested ground as Chicago continues to sprawl. Anyway, more of a localized argument rather than anything beneficial for conversation here. Labor Notes must not have viewed AWW as a political organization then. But I'm pretty sure there was either a formal or informal ban on political organizations tabling or presenting workshops. I was told originally this was because the people behind Labor Notes (folks from Teamster For A Democratic Union and the socialist organization, Solidarity) did not want rival leftist sects trying to denounce or one-up each other. I thought this is why the various anarchist political organizations often have rented a suite in the hotel, rather than had a table, because of this ban. Maybe I'm mistaken. Yes. The author of the AWW account works in a ready-made food plant in Greenford, the logistics hub in West London. Others work in warehouses and distribution centers in that cluster near Heathrow Airport and that's where the whole thrust of their organizing is centered. The confusion around Joliet is because the two-warehouse Walmart complex (site of the 2012 strike), operated and managed by Schneider Logistics as a "third-party logistics" (3PL) firm, is at the far southern edge of the Chicagoland supply chain cluster. As the author points out, it's actually in Elwood, at 26453 Walton Drive, which is a small village of 2,300 in Will County. 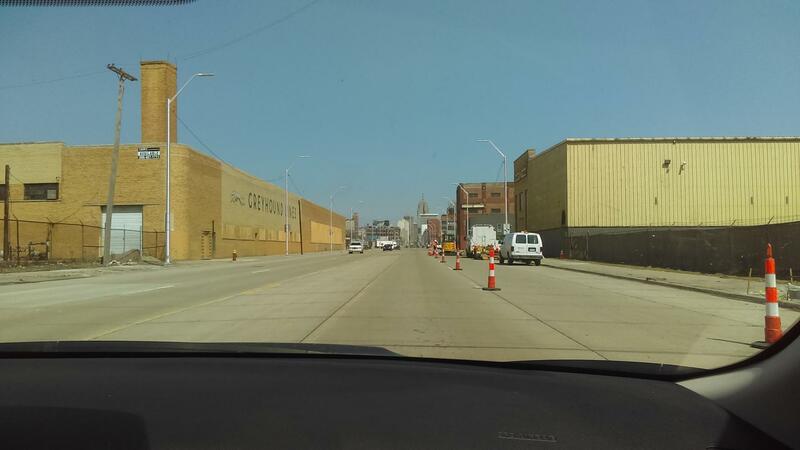 As the driver of the car in the "warehouse-spotting expedition," I have to point out that we actually did drive through the city of Joliet and then headed south past the massive CenterPoint Intermodal Center around the Union Pacific Joliet Intermodal Terminal. We had the added advantage that sitting shotgun -- and helping navigate -- was an RWU comrade who's a BNSF engineer who could explain all the rail infrastructure we were driving by; the other comrades were able to compare the size and scale of Chicagoland warehouses with those in Poland the U.K. It was another 20 minutes -- and 10 miles -- before we passed through a patchwork of farms and truckstops (see photo below with the Bluesmobile at a truck stop; I realized here how the characters in The Blues Brothers got their names: Elwood and “Joliet” Jake Blues) to reach the cluster around Elwood, due east of the huge railyard at the BNSF Logistic Park Chicago. And yes, having personally toured the railyards of Chicagoland in 2015 where we continued southeast into Indiana, the Elwood complex is still in the rural hinterlands at the southern fringes of Chicagoland and is definitely an exurb. As for Labor Notes and their policies and exclusions, I haven't seen this personally but I trust that you're correct about their practices in the past. But in 2011 Oliver Twister and myself co-presented at a regional Troublemakers School in the Bay Area about the history of U.S. general strikes and the recent uprising in Wisconsin, from a clearly Wobbly-esque perspective and were fully welcomed. I've only attended the last three biannual Labor Notes Conferences in Chicago because of my involvement in RWU, but at the first one in 2014 I was invited to facilitate a panel discussion, called "Transport Strikes Worldwide," with logistics workers, all of whom had recently been on strike. It included dockworkers from Hong Kong and Chile, a subway worker from Buenos Aires, and a militant railroad trade unionist from South Korea. I made no secret of my ultra-left, anti-authoritarian politics, yet I was accepted in a comradely way. Now to Juan's point, had I been a Trotskyite from some heretical tendency, that might not have been the case. I flew in under the radar, as I image PM Press does as well, as the are openly anarchists and have tabled at every conference I've been to. The gossip from the last Labor Notes was that BMWED has bad blood with TDU, hence they pulled their whole delegation of scores of members at the last minute, leaving even more ill will between those groups. As for renting suites in the hotel, many groups do that for the parties in the evenings. That's just a Labor Notes tradition, with TDU going one step further and renting a huge hotel ballroom for their evening festivities. I've never attended it, though I've been to several other parties in suites and in much smaller individual hotel rooms. None of the comrades we stayed with in Chicago for the conference had even been there. It was around a 45 minute drive from the city. We went there on a warehouse-spotting expedition to get a sense of the scale of the place. Going there made it all the more impressive that such a struggle had taken place there that shut the warehouse down, ordinarily out of the eye and ear-shot of most of the city’s activists.